New theatrical releases in 2019 pretty much fall into two categories: blockbusters, and things that are… not that. We get four films of the latter variety this weekend as we all just bide our time until The Avengers come and save us all in two weeks. Of the four new releases, only one of them can claim that the opening weekend was acceptable, kind of a recurring theme in 2019. None of them were any threat to Shazam!, which gets a second weekend at the top. With $25.1 million, Shazam! wins the weekend pretty easily, despite a slightly troubling 53% drop from opening weekend. It’s got $94.9 million after two weekends, and while this is still pretty good, Warner Bros. was probably expecting it to crack $100 million by the end of the weekend. They’ll have to settle for Tuesday instead. 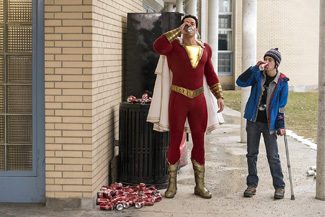 With a rather barren marketplace and solid word-of-mouth and an ideal family film, it’s typical DC that Shazam’s second weekend drop couldn’t come in under 50%. It’s got one more solid weekend ahead of it, and should win the weekend with minimal competition, before Marvel laughs at its puny box office and The Avengers: Endgame earns more in two days (not even a full weekend) than Shazam! will have in total at that point. In a mild upset, second place goes to Little, the best performer of the weekend’s four new releases. Earning $15.5 million, Little did have a couple of things going for it, one of which was its Big-like premise (but in reverse) and it also starred Regina Hall and Marsai Martin (of black-ish fame). Critics didn’t care for it (just 49% Fresh at Rotten Tomatoes), which may have prevented a real breakout. Still, it only cost $20 million to make, and it’ll have that back by next weekend. This is where the good news ends for this weekend’s new films. Hellboy places third on the weekend, but with $12 million, this one is a far cry from the Guillermo del Toro/Ron Perlman films. The reboot of the character, which is something that feels like it should have happened sooner, this opening is essentially a disaster, especially when the first film opened with $23.1 million in 2004 and the sequel managed $34.5 million in 2008. Critics hated it (15% Fresh) and audiences weren’t compelled to see this gritty reboot (earning an R-rating as opposed to the PG-13 rating for the del Toro films). Lionsgate did hedge their bets here a little, keeping the budget to $50 million, but it’s not going to come anywhere near that total. I don’t even think this will play well overseas, so any hopes for a sequel to the reboot likely died with this disappointing weekend. Pet Sematary dives 59% from opening weekend to $10 million, giving it $41.1 million in two weeks. It’s a fairly typical horror film drop, but all is fine here as it only cost $21 million, which it had made back after last weekend. More Stephen King reboots are certainly coming, and of course there is the sequel to IT coming later this year. Tim Burton’s Dumbo falls another 50% to $9.1 million and has $89.9 million after three weekends. This is probably not how Disney envisioned their live action reboot year starting, but I’m much more optimistic about The Lion King’s chances later on in the summer. (Let’s not talk about Aladdin just yet.) Dumbo will stagger over the $100 million mark in two more weekends, but the $170 million production budget is gonna smart, even though worldwide grosses have it presently at about $270 million. Captain Marvel earns $8.6 million in its sixth weekend, giving it $386.5 million to date. It’s still on target for the magic number of $500 million. The interesting thing to watch may actually be the next two weekends, to see if people decided to pregame Endgame by seeing the other Marvel film still in theaters. It actually happened with Black Panther, which had its two lowest weekend declines the weekend before and the weekend of Infinity War’s release. That may have just been a one in a lifetime anomaly, but it’s something I’ll be looking at. Jordan Peele’s Us earns $6.9 million (down 50%) in its fourth weekend and has a total of $163.4 million. If there’s literally anything to complain about here, it’s that it’s still not at Get Out’s box office yet, and really, that $176 million total might be the final landing point for Us as well. What that basically means is Peele didn’t expand his audience beyond Get Out, they just all showed up much sooner thanks to the goodwill earned by Get Out. I think that’s a minor nitpick, but it’s something worth mentioning. Down in eighth place, we have another of this weekend’s openers, as After earns $6.2 million. Based on a novel, its earliest incarnation was as One Direction fan fiction, and if you’ll excuse me I need to go take a shower before I can continue discussing this. Popular online, the author got a book deal and all references to Harry Styles and Zayn Malik were removed (I mean, come on, Niall is the most talented one, and uhh, hey look over there!) and a film adaptation was inevitable. Eviscerated by critics (I’m surprised they even bothered), the best I can say is that at least it only cost $15 million, even though it might not get that back in theaters. Despite the best reviews of the new releases, Missing Link is the biggest disappointment of them all, with $5.8 million for the animated entry despite 3,400 theaters. The latest release from Laika, United Artists apparently skimped on the advertising budget for this one, as the marketplace seems welcoming to an animated release during this empty time while we wait for Endgame. Laika’s films aren’t the most commercial, but their last entry, 2016’s Kubo and the Two Strings, earned $48 million and had wide critical acclaim. They’ve also had decent mid-tier hits in ParaNorman and The Boxtrolls, but this will go down as an epic misfire. The Best of Enemies wraps things up this week, sliding 55% to $2 million. The weirdly timed race relation drama starring two people who seem popular come awards season has a mere $8.1 million in two weekends in theaters. The top 12 films in theaters this weekend tallied up $104.7 million in box office, well down from last year’s $131.7 million when Rampage earned the high score with $35.7 million, and the second weekend of A Quiet Place made $32.9 million. Next weekend it’s the proverbial calm before the storm as it’s another weekend of middling releases, the best of which include horror entry The Curse of La Llorona and faith based entry Breakthrough.